Hydrurus foetidus (Villars) Trevisan is a benthic freshwater alga in the class Chrysophyceae. Under seasonal climate regimes, it may be found in rivers during the cold seasons. It is widely distributed in cold-temperate, polar, and periglacial regions. Its heavy extracellular polysaccharide coating and its importance as food for grazers under cold conditions may indicate a potential for applied purposes. The strain G 070301 has been kept in culture since 2007. In this presentation, we have fine-tuned our laboratory culturing, detected the presence and positions of lipids in the cells by fluorescence imaging, and performed a preliminary analysis of the unsaturated fatty acids in Hydrurus grown on minimal medium. Little is known about the physiological adaptability of chrysophytes for applied purposes. Following optimization of media and a simple harvesting technology, the psychro- and rheophilic species H. foetidus may have a future as a source of polyunsaturated fatty acids for inland aquaculture and for polysaccharides. 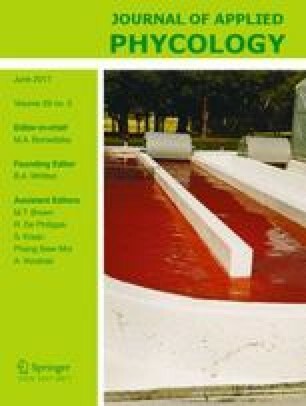 The author is grateful to Thomas E. Gundersen, CEO at Vitas, for the advice concerning the preparation of material for the present and future analyses of algal components. The project has been supported by the Finse Alpine Research Centre (www.finse.uio.no ), and the author is indebted to its personnel.